Having people come visit your farm can simultaneously be very stressful and the most fun you've had all year. With how much transparency is playing a part in small farm marketing these days, on farm events are a great way to get your customers (or potential customers) involved in the farm. This farm podcast is about our first annual Hop Harvest Festival at Camps Road Farm. What we did to plan it, how we pulled it off, and what we plan to do differently next year. We had great success this year inviting over 50 people to the farm to take part in our hop harvest, hang out and socialize, eat some great farm food, and enjoy the fruits of our labor. The attendees ran the gamut from long-time dedicated CSA members to people who had just heard about the farm and wanted to come and check it out. Across the board good times were had by all. Our Hop Harvest Event was more to save our behinds on labor than it was to get people to the farm to sell them stuff. In that case mission accomplished. The "money earned" was the money we saved on labor. It was also great marketing for us in terms of getting people involved and actual press coverage. We're definitely going to plan more events like this in the future. Some we'll sell tickets or "seats" to classes and workshops, and some we'll have people on as volunteers to help us get stuff done on farm. I actually have a good one coming up that is going to be great for the farm. In the coming weeks we are having a fleet of school children come to the farm to get the farm experience. We have built a relationship with a couple of the local schools and mutually came up with the idea to get the kids involved in local agriculture. Now I've had better Farmers' Markets than that sure, but with months of work leading up to it. There isn't that much we have to prepare on farm that we don't already do to have 135 school kids come visit. We keep the farm beautiful and safe, we have working and clean bathrooms, and there's always plenty of things to look at, talk about, and get involved in. So NET dollars, we are going to blow our best market sales out of the water. That being said, we are going to invest the majority of that into purchasing supplies for hosting big groups like this. I'm very interested in looking into farm events as a serious part of our farm business plan. What it takes to host an on farm event. How we planned and executed our first harvest festival. What we would change in the future to have a better experience for ourselves and our guests. 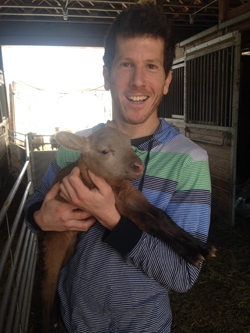 Picture of Barry hold a lamb: Check! Barry is one of the best “go-to” guys on the planet. As co-brewery manager Barry has proven an invaluable resource to the farm as the brewery takes time to go through the licensing process. Barry has been surrounded by small local businesses his entire life. His grandparents moved to the United States in 1947 and started a small bakery in Lake Hiawatha, NJ, to support their young family. Barry’s father has owned and operated Merit Financial, a small mortgage bank, just down the road from his parents’ still-standing bakery. After graduating from Muhlenberg College in 2004 with a B.A. in Philosophy and Business Administration, he moved to New York City and began his own career in mortgage banking. Soon Barry would open and manage a branch of another company in downtown Manhattan. By the end of 2007, with the credit crunch tightening, he decided to exit the mortgage industry. Barry took this time to travel, reassess his priorities and explore what would be next for him. While traveling, Barry became enthralled with how local environment, cuisine and history shapes a region’s beer styles and traditions. Barry has always enjoyed culinary creativity, whether baking with his grandparents as a child, or hosting dinner parties as an adult. These ideas led Barry to first consider opening a brewery. What does your farm have to offer for people coming to visit? Would adding in events be a feasible and viable part of your agricultural venture?